The best way to get around the Sacred Valley is to hire a driver. While hiring a driver is a luxury that we choose not to afford in other countries, it is very affordable in Peru, especially split between two couples. We started off in Moray, an agricultural site of concentric circles. The Inca, brilliant as they were, created varying environmental zones with their enormous circular terraces. Meaning, it was cooler at the bottom most central circle for cooler crops and warmer up higher up for crops that could withstand the heat. 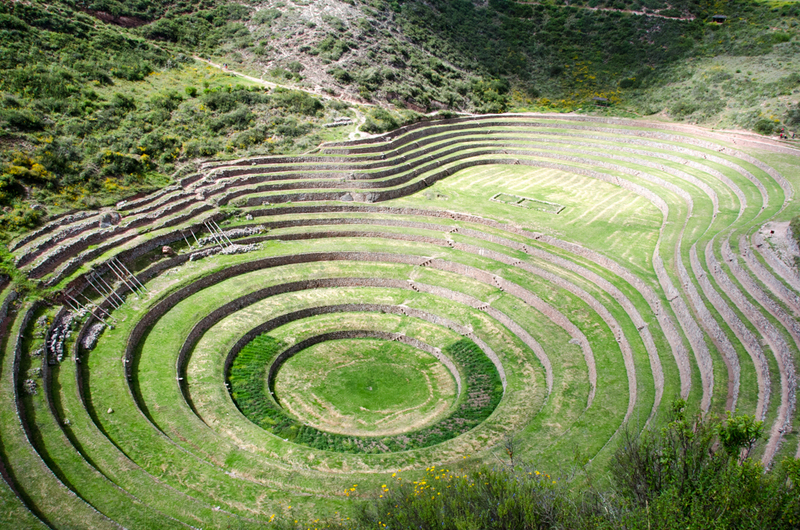 As far as I can remember, there is no entrance fee for Moray and you can walk down in the ruins which was pretty neat. As we drove to our next adventure, our driver took us on an unexpected one. Willian knew that we wanted to have an authentic experience. He offered to take us to a friend who serves a drink called chicha. All we understood was the word for corn and figured, why not? Well, I'll tell you why not. While we expected a refreshing bevy, we actually got beige, room temperature fremented corn juice in a dirt hut with guinea pigs squeaking at our feet. It was quite the happening place, with many workers coming in for a midday chicha break. "For strength!" they said. Chicha morada is a beverage made from purple corn. Popular and typically served cold, like a juice. That version is delicious, ours was....well, not. But we drank it! Gotta save face. And have a good story to share. Why guinea pigs, you ask? Cooked guinea pig, locally known as cuy, is a dish served in Peru. 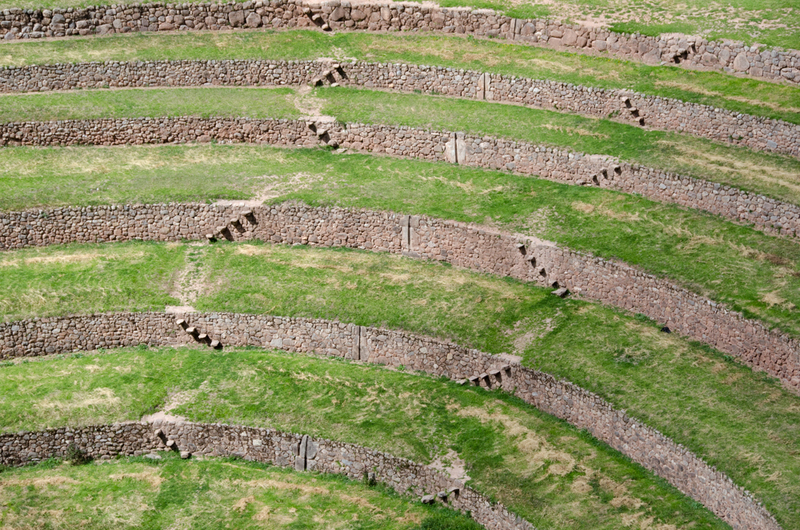 While we consider guinea pigs as pets for little kids, the Peruvians know better. Apparently cuy is a super healthy meat compared to red meat or pork. But I had a pretty hard time looking past that especially with them running around my feet. 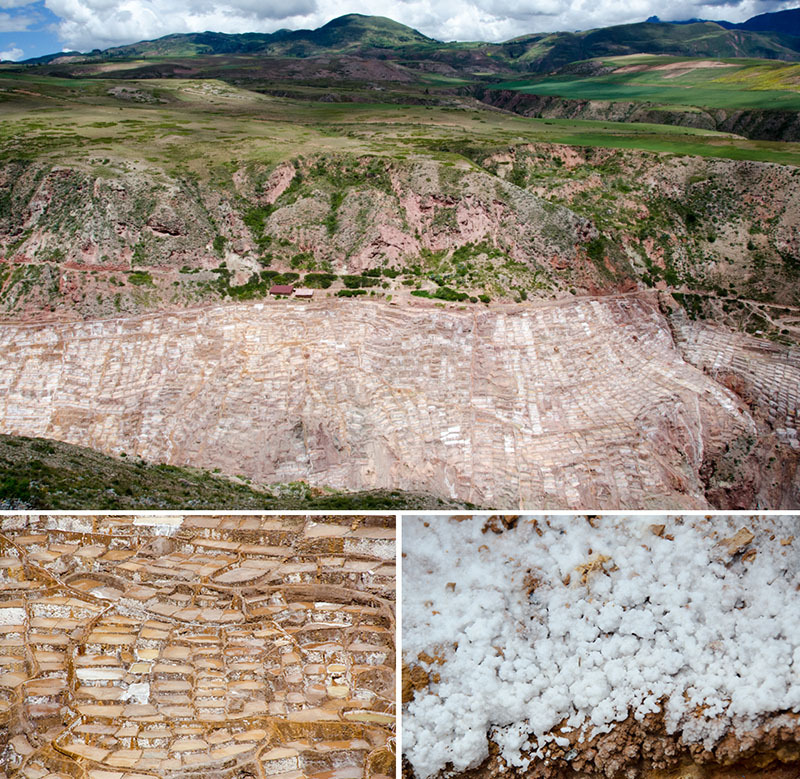 Salineras which are centuries-old terraced Inca salt pans. They are still used today and we saw someone tending to his salt plot. 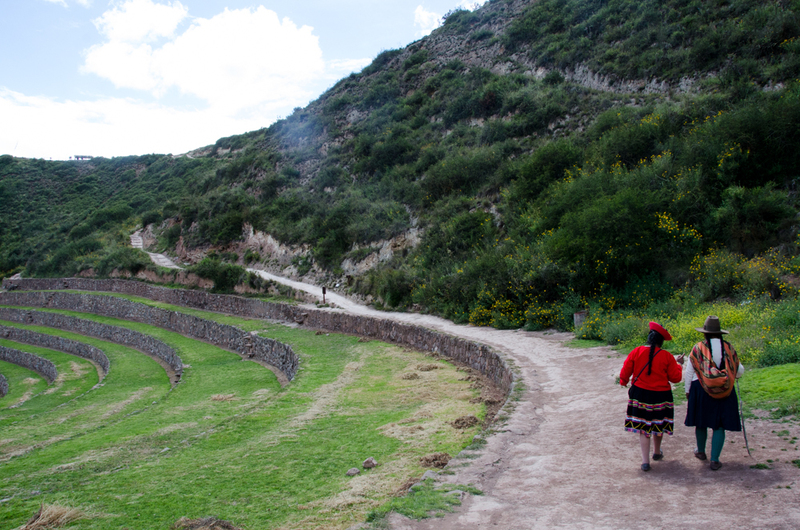 Next up on our Sacred Valley tour was the town of Chinchero. Chinchero, birthplace of the rainbow or so they say, is a small yet important major Inca town in the Sacred Valley. 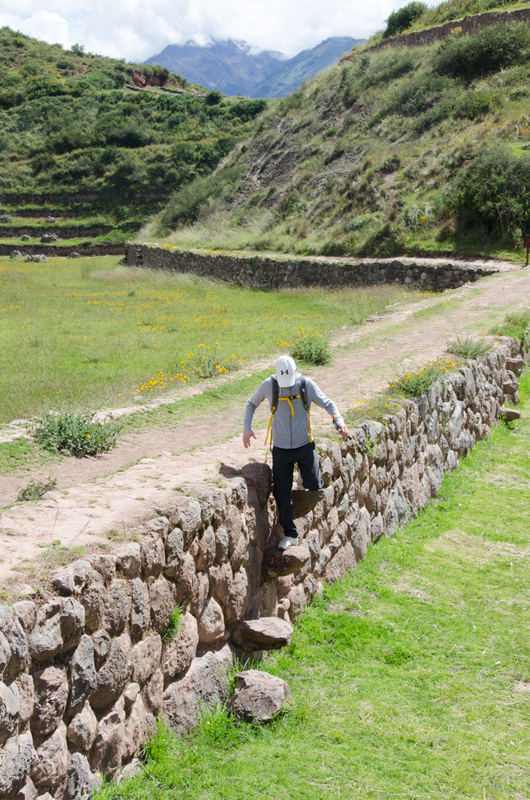 It is one of the only towns in the Sacred Valley that has higher elevation than Cusco (more than 12,500 ft). 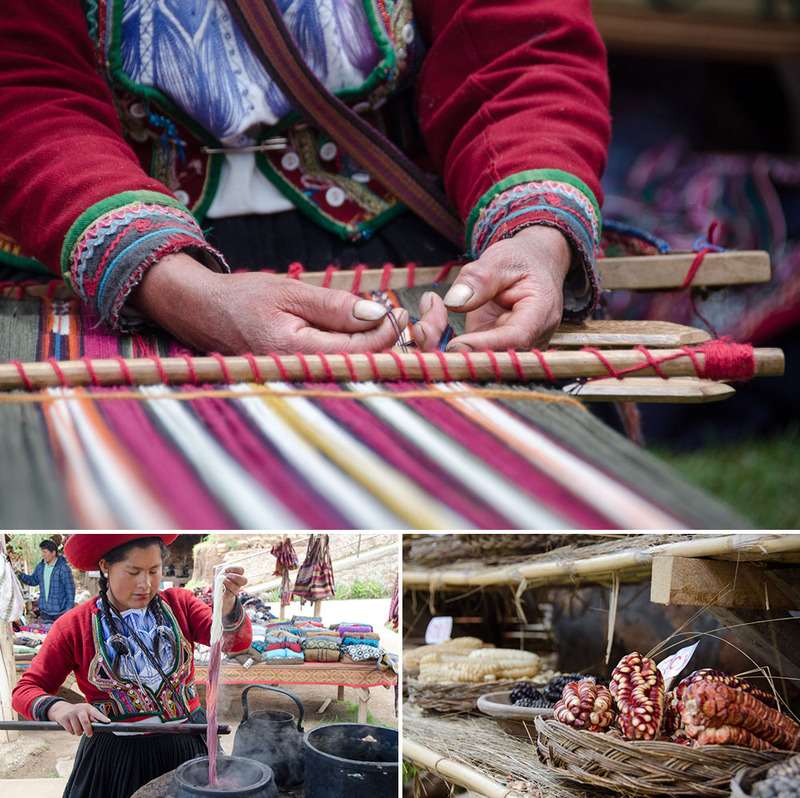 We started at Centro de Produccion Artesanias Andina where we learned about the weaving tradition and techniques of Chinchero. Add a couple of alpacas at the entrance and some cuy (guinea pig) in a cage and you have a bona fide tourist attraction. Yes, it was touristy but we were able to buy some beautiful blankets. While a bit more expensive than at the Chinchero market, the quality was much better. That blanket is still on my couch and I get compliments on it all of the time! Sadly, we did not buy the hats. Missed opportunity. 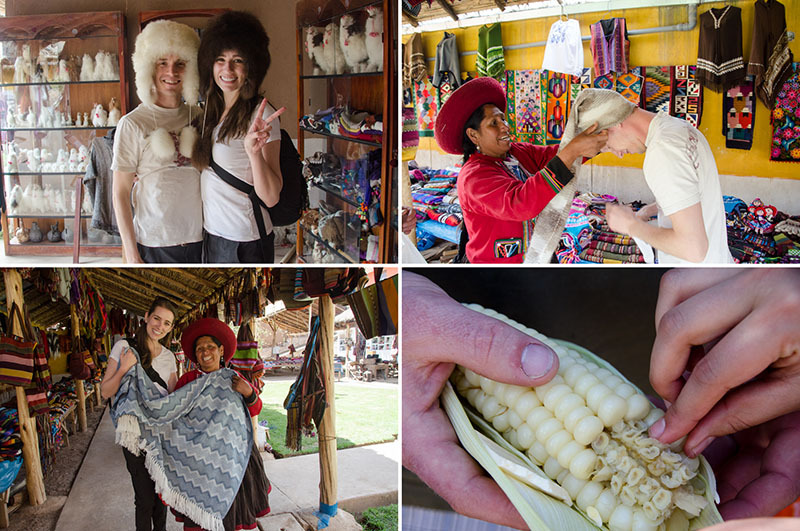 After stopping for a corn snack and exploring some ruins and the Chinchero market (better prices than the weaving co-op but the quality isn't as good), we headed out to Pisac. Only to find that the ruins closed early but we did get a chance to wander through the famed market (my review: it is a market just like any other). It was only fitting to end our day with our Peruvian mascot, a cuy wearing a vest and bowtie leading an imaginary choir.